The ancient Greek story of Odysseus returning home from battle is one that has been passed down through the generations for decades. Odysseus has been immortalised in this tremendous online slots uk game with 5 reels and 30 amazing paylines. The game board is a Greek sailing vessel and the symbols are filled with Spartan helmets, sovereigns and a lovely gamble bonus that will have you risking it all for the Greek hero. Join and play Easy Slots now! Playson burst onto the scene in 2012, and since then they have taken the iGaming industry by storm and quickly become one of the favourite brands here on slot games online casino. This new developer already has 30 high definition online slot games in their bag, and have many more in development. They have a motto to provide “unique gaming solutions” which you can see if their innovative online slot games, many featuring game play that hasn’t been seen before. Playson specialises in high definition, giving players exciting 3D graphics in crystal clear clarity to accompany their entertaining themes. As they continue to expand their enterprise, you will see that this is a name to look out for. We also often run various uk bonus slots with this game. 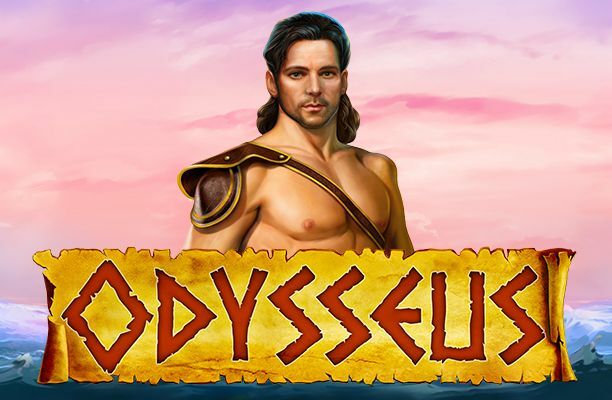 Step into the world of legends with Odysseus online slot as you join one of ancient Greece’s greatest heroes on his voyage home from the legendary Trojan War. With this 5 reel, 30 payline slot game you will discover ancient riches, precious artefacts and heroic prizes. You can start this epic journey from 30p up to £150 a spin, ensuring that no adventurer is left behind. Set against a backdrop of the Aegean Sea, the reels are set in the red sail of Odysseus’s ship. Decorating the reels are Hellenic themed symbols, such as Achilles Helmets, Trojan Horses, Greek Warriors, Laurel Crown, a Lyre, a Coin, a Shield, a Vase and Odysseus himself. The Ship is the Wild symbol and this will substitute for all other symbols bar the Scatter to help you with your winning combinations. Athena is the Hellenic goddess of wisdom, she was also Odysseus patron goddess, always keeping an eye out for him during the Trojan War and on his long voyage home, so it is fitting that she is the Scatter symbol in this adventure slot game. 3 Athena Scatters anywhere on the reels will reward you with 10 Free Spins, 4 will give you 25 Free Spins and 5 Athena Scatters will reward you with the heavenly gift of 100 Free Spins! You can also retrigger more free spins during the feature by landing the same Athena Scatter combinations. So, pay special attention to this goddess, and hopefully she will shine down on your as she did with Odysseus. 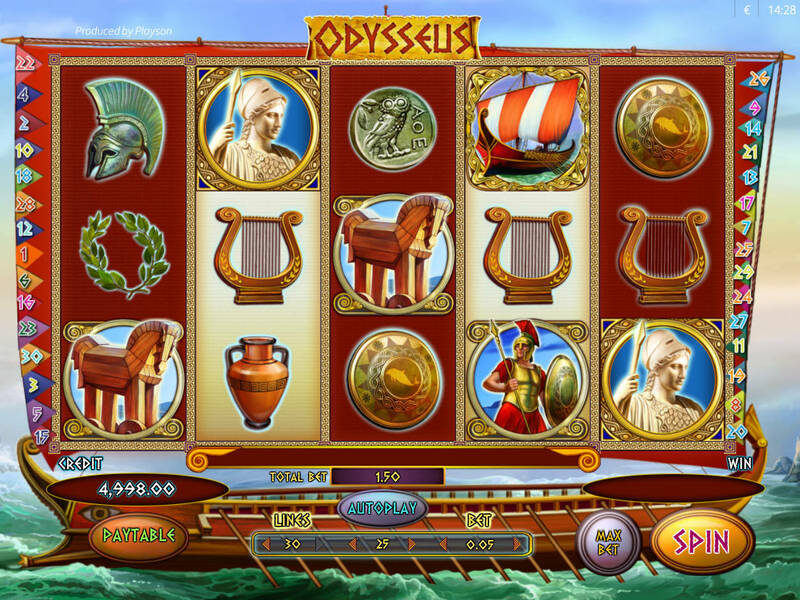 Odysseus online slot also comes with a Gamble feature which you can play after every winning spin. This will give you the opportunity to double or quadruple your winnings in a chance game of double or nothing. If you decide to play, you will have to choose the colour of the card to double your winnings, or the suit to quadruple them. If you guess incorrectly you forfeit the bet and return to the main game, discover more! 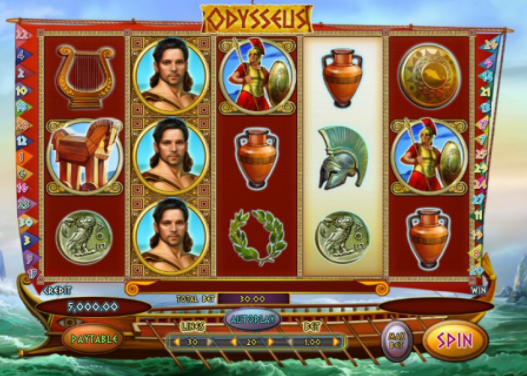 Are you ready to go on the adventure of a lifetime with Odysseus online slot? With an epic theme that will take you across the seas from the comfort of your own home, you will be thoroughly entertained by this slot from Playson. With a wide betting range, this epic hero welcomes players from all backgrounds to get on board his ship, so if you are a high roller or a low limit player, you can still come on a legendary journey and be blessed by the gods. If you enjoyed Odysseus then why not try Shamans Dream Slots Game.